The United States on Thursday offered an additional 60 million dollars in aid to the Syrian opposition, but all of it will be non-lethal assistance, DPA reported. US Secretary of State John Kerry told participants at a conference on Syria: "The US will be providing an additional 60 million dollars in non-lethal assistance to support the efforts of the Syrian opposition coalition over the coming months." He said that "we will be sending medical supplies and food to the (rebel) Supreme Military Council, so there will be direct assistance." 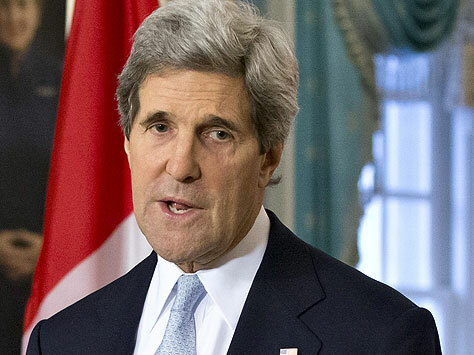 Kerry said the decision was aimed at increasing the pressure on Syrian President Bashar al-Assad to step down. "President Assad is out of time and must be out of power." The United Nations estimates that at least 70,000 people have been killed since the uprising against al-Assad's regime started in March 2011. Earlier this month, the UN High Commissioner for Refugees said there were more than 800,000 registered Syrian refugees in neighbouring countries. That number increases by 5,000 each day. Participants at the Friends of Syria conference pledged political and financial support for the opposition, and "underlined the need to change the balance of power on the ground." They also condemned "the unabated arms supply to the regime by third countries," in an apparent reference to Russia and Iran. Russia is a main supporter of al-Assad's regime and, along with China, has used its veto power in the UN Security Council to protect Damascus from international sanctions. Kerry said at a press conference with the leader of the Syrian opposition coalition, Moaz al-Khatib, that the United States "will not leave the Syrian people alone." Al-Khatib called for creating humanitarian corridors in restive areas in Syria under a chapter in the UN charter that allows the use of force. He lashed out at al-Assad, telling him to "act like a human being for once and stop killing children." Al-Khatib had last week said that he would stay away from the Rome talks to protest what he called the world's silence over atrocities in Syria. But he changed his mind after the United States and Britain indicated they would offer specific aid to the opposition. In Moscow, French President Francois Hollande said he would ask his Russian counterpart Vladimir Putin at a meeting expected later Thursday to drop support for al-Assad. Moscow's position was crucial in determining when peace could come to the country, Hollande said in an interview with Radio Echo Moskvy. Hollande added that, like Russia, he opposed foreign military intervention in Syria. He stressed that this was one reason why France was not sending weapons to help the rebels. "France keeps its word," Hollande said. "Europe has imposed an (arms) embargo." Meanwhile, the European Union extended its sanctions against the Syrian regime for a further three months, a step foreign ministers had agreed earlier this month. This includes a full arms embargo on the country. In Syria, a car bomb exploded in a regime-held area in the central province of Homs, causing several casualties, state news agency SANA reported.